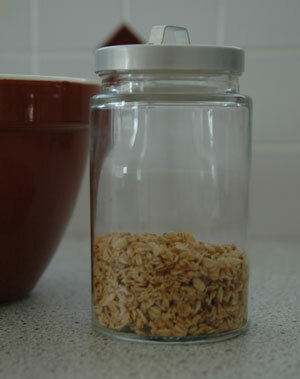 I made some granola yesterday from The Baby Bistro Cookbook by Joohee Muromcew. This is the second time I've made this recipe and I love it. I had planned to take a photo of it coming out of the oven, or at least with the jar filled up...this seems to be all that is left! It went quick and I have to admit that I ate most of it. My almost three-year-old likes it, but really doesn't want it on his yogurt as I hoped he would. Up to 2 Cups in total of sesame seeds, unsweetened flaked coconut, sunflower seeds, chopped or silvered nuts, and/or puffed rice cereal. Preheat oven to 300 degrees. Line a baking sheet with aluminum foil. Mix up ingredients, spread evenly on to prepared pan no thicker than 1/2". Bake, stirring once halfway through, for 25 minutes. Remove from oven and let cool. Makes 5-6 cups. I used oats/almonds/puffed rice for this version. Now, if I could just figure out whats for dinner!